It is time for a new Scrap'n Stamp Blog Hop, and the start of a new challenge on the Scrap'n Stamp Facebook page. We are celebrating backgrounds this month. There are numerous ways one can achieve a beautiful background to showcase on their cards, and the design team have a few to share through this hop. We have prizes to be had with 8 Background Prize Packs and 1 $50.00 Gift Card to the Scrap'n Stamp Store. 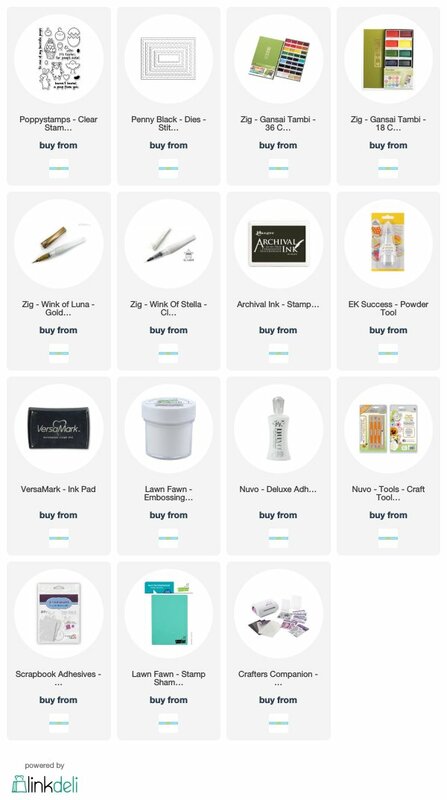 And, that is not all - we have a 20% discount code to share with you when you purchase your very own set of Life Changing Brushes. So be sure to visit each of the designers on the hop and leave your comments for a chance to win. Back to the card I made for today's hop. I painted a plaid background for the backdrop to my Easter card. This is something anyone can do, trust me! I can not draw a straight line if my life depended on it, but that is not important for this kind of background. The background is an important part of the scene I created for this Easter card. I used Rose Madder, Cadmium Orange and Cadmium Yellow for my background, along with a Zig Gold Pen. I would normally use my Wink of Stella Gold, but I could not find it! Once finished with my plaid, I die cut my piece using Penny Black's Stitched Stackers Die and attached to my card base. Using Poppy Stamps To All My Peeps and a couple of older dies from Memory Box and MFT and again using the palette of paint colours, I stamped and painted my images, then cut them out. I die cut a piece of 36lb vellum and attached using my Vellum tape. I styled my pieces then arranged my scene, gluing some pieces and using foam squares on other pieces. I stamped the sentiment with VersaMark Ink and heat embossed with white embossing powder, attaching with foam squares. To finish I added clear Wink of Stella to the flowers, the bottom of the clouds, bunny ears and the noses of the birds, along with all of the decorated eggs. Following is the video on this card, as well as affiliate links to the product I have used. I had great fun making this card, and hope you have enjoyed it. Now on to Susan's blog. If you have lost your way, following are the links to all those participating in today's hop. Enjoy! 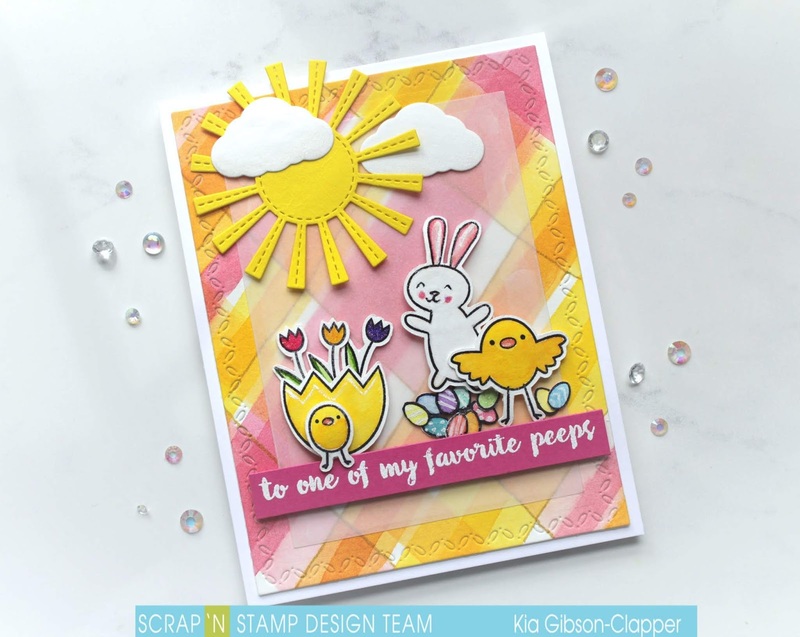 Those Spring/Easter critters are adorable and I love the background! I can't believe that you painted your own background! That's amazing - and the whole card is stunning! You had me laughing Deborah ... thanks so much. So fun and pretty!! Love your card Kia! I love these warm colors! What a gorgeous background!!!! Pretty background. Like the use of vellum - I always forget to try it. Thanks very much Nana711 - and thank you for joining in with this month's hop. Thanks very much Johanne, and thank you for joining us for this month's hop. Thanks very much Leanne, and thank you for joining us this month. This is so cute!! I LOVE the scene you created!! Many thanks Nora, and thank you as well for joining us for this month's hop. Adorable card! 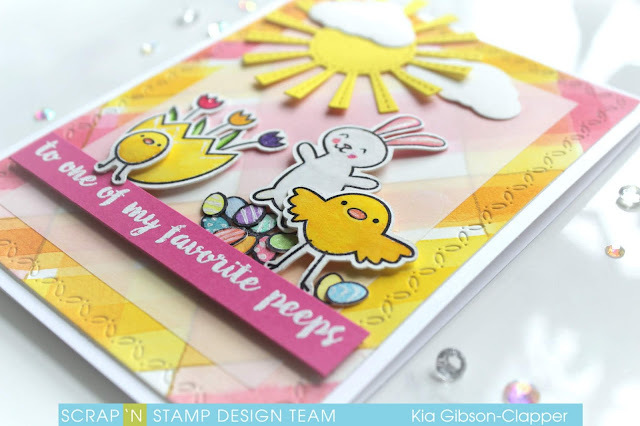 Love the fun plaid background you created and the sweet bunny and chicks! Pretty details and color combo! Thanks very much Denise, and thank you for joining us this month. Adorable card! Love the plaid background you created. I’m going to have to try that soon! Many thanks Donna and thanks for joining us this month. Do try the plaid, it is a nice change and fun to do. Love that you made your own plaid, in the colors specific to your own project! Thank you Sandi Lou, it was fun to do. Thanks for joining us for this month's hop. 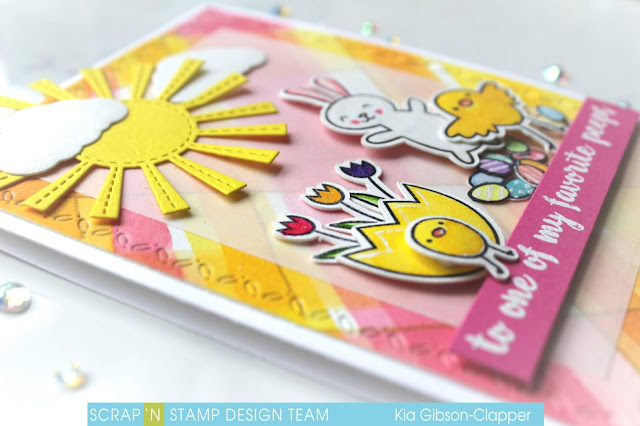 This is such a happy card for spring. The vellum is a nice touch. 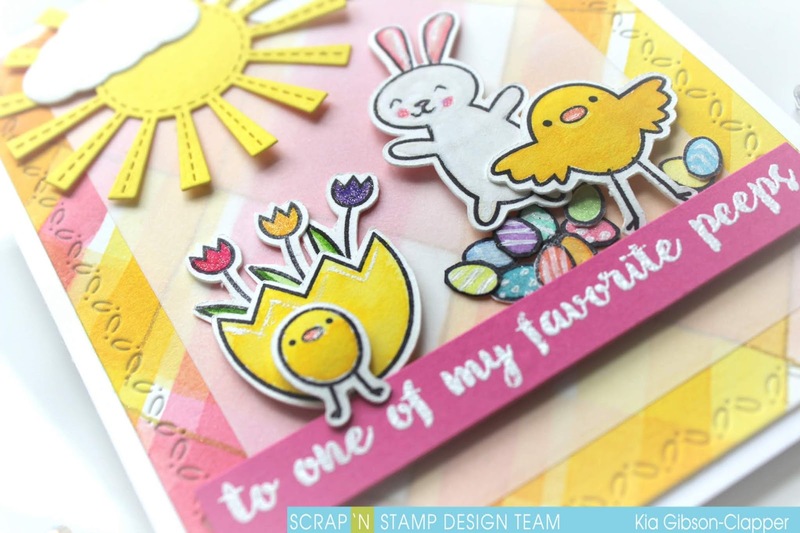 Thanks so much Charmaine, and thanks for joining Scrap'n Stamp for this month's hop. Very cute card! I love your plaid background. It's making me yearn for Spring! Thank you bunches Wendy ... it is a fun background to make, especially this time of year. Thank you for joining us for this month's hop. Thanks very much Kelsey and thank you too for joining us for this month's hop. Love your free hand plaid background and the happy colours you chose! Many thanks Sue, and thank you for joining in with this month's challenge. What a wonderful and fun Easter card! I love the plaid background. Thank you Mary-Anne, it was fun to make. Thank you for joining in with the challenge this month.